Perennial herb, up to 60cm high, native to Central Asia (Kazakhstan, Kyrgyzstan, China-Xinjiang). 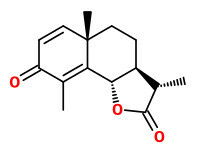 The dried flower heads (collected before full flowering, Flores Cinae) contain the antihelminthic santonin (2.0-3.5%) and volatile oil (2-3%, with 1,8-cineole as main component). It was formerly used together with laxatives to treat roundworms but its therapeutic index is very low.